No, dispatchers don’t really scan your social media profile, and even if they did, it would be illegal for them to refuse you aid because of your sentiments vis-à-vis having sexual relations with police officers. This meme is pure fantasy, which raises the question: What twisted, dark, depraved mind fantasizes about a world in which a person can be abandoned to die for exercising his or her Constitutionally-protected freedom of speech on social media? Apparently, The “Rational” Party does. I looked up rational in the dictionary, and this meme isn’t it. This meme is petty and vindictive, and those are its best qualities. Imagine a scenario where you are angry, frustrated, maybe even fearful enough to write “F*ck the police” on your favorite social media outlet. What could have driven you to do so? Some people – the aforementioned “Rational” Party, perhaps – would say that only criminals fear the police, but that’s myopic and wrong. If you’ve followed the news recently, you know that many people who have committed no crime nevertheless have a valid reason to fear the police. I’m not only referring to black folks; Hispanics, poor people, and the mentally ill have also born the brunt of unjust police aggression. Any one of a number of disadvantaged minority groups could express their fear, distrust, and disdain for law enforcement officers, and I would understand their position. There are also the supporters, by which I mean non-minorities who see what’s happening and find it disturbing. A sympathetic soul – unlike a member of the misnamed “Rational” Party – might also post a derogatory meme about police officers, and by extension, the culture that allows them to be abusive toward minorities. Our hapless victim might not be a member of a minority group at all; he may simply have had enough. Who can blame him? Who can look at the various ills that plague the justice system and not be disgusted to the point of profanity? Let’s not lose sight of the most important point, though. Whether the caller was justified in his social media rant or not, the police are not absolved of their responsibility to serve and protect. That may be the most concerning problem with this meme. Police officers swear an oath to uphold the law, and that oath does not include the words “unless the guy hates cops.” Could you imagine if a doctor refused a life-saving procedure because he found out that his patient tweeted about how much he hates doctors? Of course not! That doctor would be justifiably booted out of the medical profession! So what makes it such a funny fantasy to imagine a police officer or dispatcher doing the same thing? As always when I write about police brutality against minorities, I feel compelled to reassure my readers that I know the problem isn’t endemic to all, or even most police officers. But there’s a culture of protection for crooked cops that does stain all police officers. That culture is maintained by people like the “Rational” Party, who, instead of acknowledging the problem and working to fix it, would rather blame those most affected by it. Seriously. F*ck the “Rational” Party. Noooo, that’s assault, and it’s a crime. There are a lot of problems here. Let’s enumerate them, shall we? This meme is based on a logical error called a non-sequitur (Latin for “does not follow”). 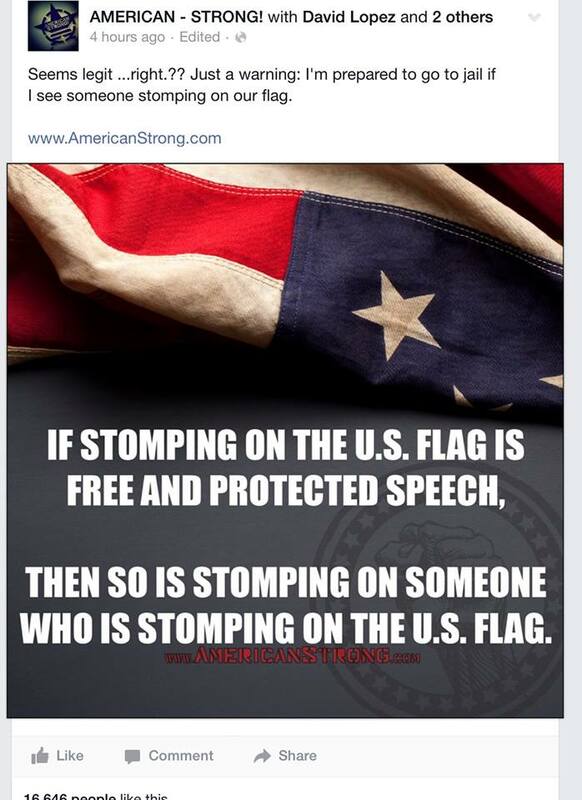 It opens with a premise (“Stomping on the U.S. flag is free and protected speech”), then leaps to a completely non-supported conclusion (“Stomping on a flag-stomper is free and protected speech”) based on nothing more than a superficial similarity between the two acts. In fact, stomping on any person is probably a crime, regardless of what unsavory act the stompee perpetrated. It’s disturbing how many people think that violence – or the threat of violence – is an acceptable way of addressing folks they disagree with (and they wonder why gun control advocates push for stronger gun laws). Toddlers are often told to “use their words” when they feel frustrated, but apparently that advice has lost its grip by the time people acquire the sophisticated vocabulary necessary to heed it. Adults who create and share memes like this are operating on a preschool level of problem-solving. Rather than try to sway public opinion with impassioned speeches, thoughtful essays, or protests, their first thought is to come out swinging. Sounds like somebody needs a time out. You ought to champion the rights of people to stomp on the flag, even if you strongly disagree with the message they’re sending. The First Amendment protects all Americans’ rights to speech, including speech that criticizes the U.S. government, its policies, its citizens, or its flag, symbolic speech, and speech that others find offensive. The Supreme Court has ruled twice (in Texas v. Johnson and in United States v. Eichman) that laws prohibiting flag desecration are unconstitutional. Despite numerous attempts by Congress to pass a Constitutional amendment that would settle the issue once and for all, none have succeeded. At least for now, flag desecration (distasteful as it may be) remains a valid and protected way for an individual to express his or her opinion. You cannot claim to be an American patriot when you are unwilling to tolerate people making full use of the protections offered by the American Constitution. 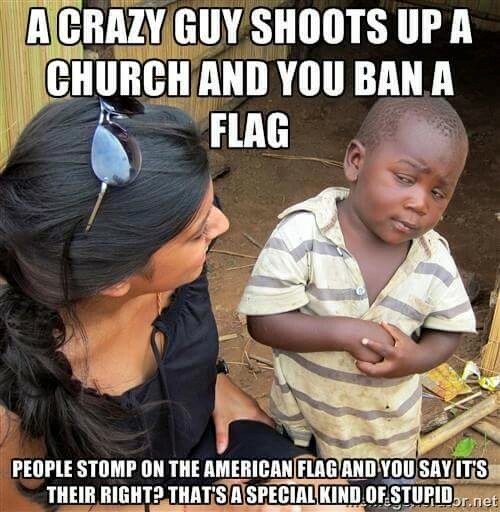 The name of the website that apparently produced this meme, AmericanStrong.com, is particularly ironic. Somebody who is so offended by displays of ideological dissent that they must hurt the dissenter is the opposite of strong. The website should be called AmericanInsecure.com. To the person who said “I’m prepared to go to jail if I see someone stomping on our flag”: are you prepared to be labeled a terrorist? Because if you hurt or threaten to hurt somebody in order to intimidate them into espousing your political position, or to punish them for expressing their own, that’s what I’ll call you. Of course, that’s just my opinion, and you don’t have to agree with it. My opinion does not come with the threat of violence; only the assertion that the person who stomps an American flag is causing less harm to this nation than the person who stomps the stomper. On June 17, 2015, a 21-year-old man named Dylann Roof shot and killed nine African-American worshipers during a Bible Study at the historically-important Emanuel African Methodist Episcopal Church in Charleston, South Carolina. According to Roof’s own statements, the mass shooting was racially motivated; in fact, Roof apparently wanted to start a race war. That Dylann Roof’s actions were motivated by racist bigotry should not be controversial – he told us so in unambiguous language – although, institutional racism being what it is, there are still media elements scrambling to repaint his actions as the symptoms of mental illness. There are other aspects of the case up for debate, however. 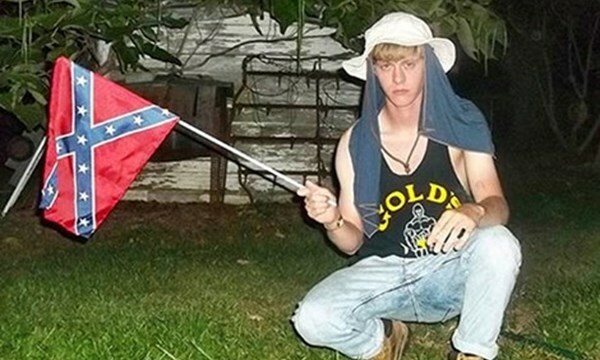 Dylann Roof’s website contains pictures of Roof posing with a Confederate flag – much more on this in a moment – the flag often identified with the rebellion that led to the American Civil War. The surfacing of Roof’s apparent Confederate sympathies has re-ignited a fierce debate about the lingering presence of Confederate flags in America, especially on government property. 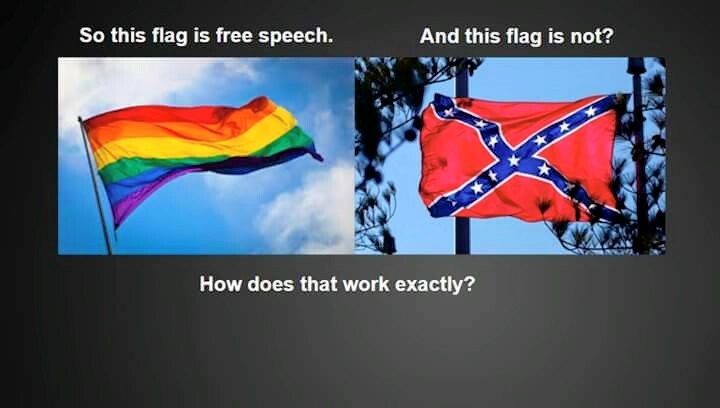 Now before we continue, I would like to make one thing clear: take a look at the right-hand flag in the second meme above. You’ll hear a lot of people referring to that flag as the Confederate flag, but it was never the official national flag of the Confederate States of America. The rectangular flag sporting a blue St. Andrew’s Cross emblazoned with white stars, set against a red background, is more reminiscent of the the Second Confederate Navy Jack, used from 1863 to 1865, or the Army of Tennessee Battle Flag. The Army of Northern Virginia used a similar battle flag, but it was square rather than rectangular. YouTuber C.G.P. Grey has a video sorting out some of the confusion surrounding the various Confederate flags. Still, for all the various flags that flew above the government and the armies of the Confederacy, the so-called rebel flag is what most people think of when one says Confederate flag. Please, spare me the pedantic comments . I know, okay? I know. As of this post, the Confederate battle flag still flies above government property in several states, including monuments to Confederate soldiers. The horrific murders at the Emanuel A.M.E. Church, and Dylann Roof’s connection to the flag have caused many people to question why state governments are still displaying a symbol that, to many, represents racial hatred and slavery. Defenders of the flag say that it’s not about hatred, but about Southern pride and heritage. People who just wish the issue would go away complain about their free speech rights being trampled upon. Oh, and let’s not forget about the historical revisionists who insist that the Civil War wasn’t about slavery anyway and who want to know why everybody’s getting so upset about it. I thought it would be helpful – nay, necessary – to take a look at the claims being made or implied by these memes. Claim: Dylann Roof is crazy. It seems like an open-and-shut case: anybody who would brutally murder nine innocent people must be absolutely crazy; what else could you say about him? To tell the truth, I don’t buy it. Crazy is a hard word to define, and even harder to apply to a person. I submit that the only disease in Dylann Roof’s mind was intense racial hatred. Claim: The Confederate flag is being banned. This is false. The word banned implies that you do not have a choice about whether to fly a Confederate flag on your porch, or to adorn your mud-splattered pickup truck with a Confederate flag bumper sticker. You still have a choice. You can still get a Confederate flag tattoo on your forehead, and you can still wear your Confederate flag swim trunks. Nobody is telling you that you cannot adorn every square inch of your body, vehicle, and home with Confederate flags. You probably shouldn’t do that, but you can if you want to. Your choice. Here’s what’s really happening, alarmist meme maker. Several state governments are considering voluntarily removing Confederate flags from government property. They’re doing this because they realize the flag has a long connection with slavery and racism, and it’s upsetting to many of the people they claim to represent. In an effort to be more inclusive and representative of all Americans, these states are choosing to distance themselves from the flag and its history. The word banned might be used in connection with many retailers’ decision to stop selling Confederate flag merchandise. In that sense, corporate headquarters are banning their outlets from selling the flag. But the flag itself is not banned in America. That’s an important distinction to make. Claim: Stomping on the American flag shouldn’t be protected speech (or the legality of stomping on the American flag is somehow connected to state governments’ decisions about flying the Confederate flag). Claim: This is a free speech issue. No it isn’t. Once again, nobody is saying that you cannot make, purchase, own, or fly a Confederate flag in any of the fifty states. Your personal rights to expression are not being infringed upon if South Carolina finally decides to pull down the Confederate flag that flies above the State Capitol grounds. If Wal-Mart will not sell you a Confederate flag suspender thong, I’m sure you can find somebody who will. Your life will continue, your rights unimpeded, just as before. Of course, these aren’t the only erroneous claims made during the recent Confederate flag controversy. If I may, I’d like to address a few other misconceptions you may have encountered in social media or at family gatherings. Claim: The Confederate flag is a symbol of Southern pride, not racism. Also, the Civil War was about states’ rights and high taxes; it was never about slavery until Abraham Lincoln signed the Emancipation Proclamation. Regardless of the fact that some Southerners have adopted the Confederate flag as a symbol of pride, the claim that it’s not also a racist symbol has never been true. By its own admission, the Confederacy seceded from the Union in order to protect the institution of slavery. The CSA committed itself from the outset to the idea that black people were inferior to white people, and that their “natural and normal condition” was to be enslaved to whites. The Confederate battle flag waved over the army of a nation that considered slavery a “positive good“. After the Civil War, the Confederate battle flag saw little use until it was resurrected in the 1940’s by a political party that strongly opposed desegregation. Remind me again how it’s not a racist symbol? The Tattooed Professor provides tons of links that brilliantly destroy Southern apologists’ arguments about the Civil War, slavery, and hate. He also demonstrates the futility of engaging said apologists in debate. If you have a friend or family member who peppers their Facebook wall with pro-Confederate memes, you might direct him to that post. Don’t expect it to convince him, but at least you’ve introduced him to the truth. Claim: The United States flag flew over a slave-holding nation much longer than the Confederate flag did, but you don’t see people clamoring to take that down. Well, some people are. But that’s not the point. Yes it’s true: the United States of America has committed some horrible atrocities beneath the Stars and Stripes, including a prolonged period of racist slavery. But while the Confederacy fought and died in defense of that peculiar institution, the United States as a nation matured and moved on. The CSA is extinct; a testament to a failed philosophy based on racism and hatred. The United States, for all its warts, lives on. We’re not perfect – we never have been – but I think we’re trying to be. Removing a symbol of racism and oppression from all government property would be a good step toward showing we’re committed to never returning to that dark past. Claim: Northerners and black people owned slaves too, you know. 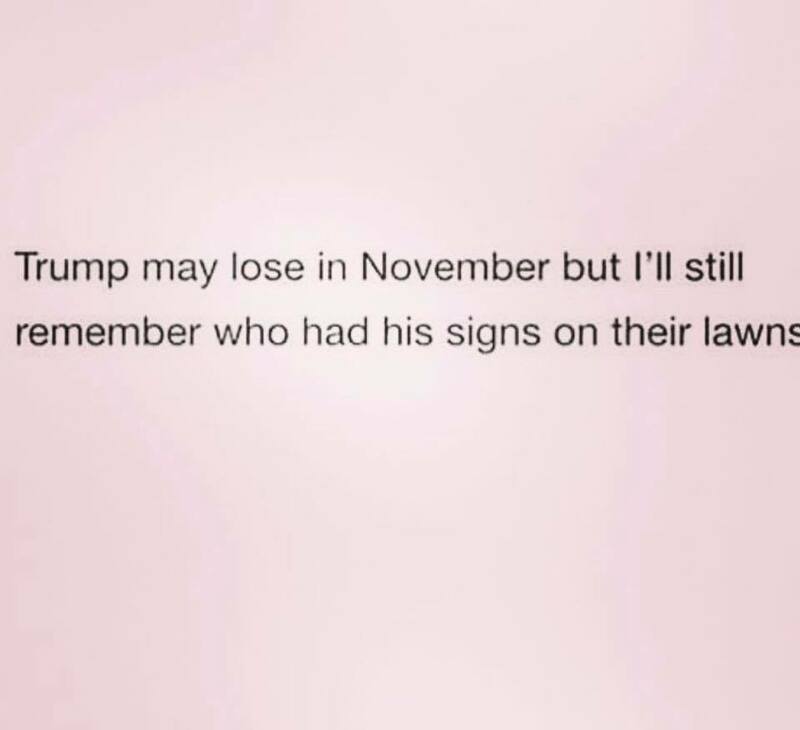 And now they don’t, at least in the United States. How is this justification for the continued presence of the Confederate flag on government property? Claim: Lincoln started the Civil War and blah blah blah I want the southern states to be justified in everything they’ve ever done: before, during, and after the Civil War. Yeah, good luck with that. The rest of us, including your more enlightened Southern peers, will continue to move forward without you. I’ve discovered this website called Twitter. I don’t know, it probably won’t take off. Anyway, I’ve created an account there called @stupidbadmemes. I have no idea what I’ll use it for, but if you’d like to find out along with me, feel free to check me out over there. While this meme aims at a real imbalance that needs to be addressed, it is Stupid and Bad enough to miss the mark. Allow me to explain. Recently California Governor Jerry Brown issued an executive order to address dwindling water supplies across the state. Governor Brown’s executive order includes a sweeping set of restrictions on water usage; sweeping, that is, to everybody except the two largest water-using industries in the state of California: agriculture and oil. Agriculture alone uses 80% of California’s water and produces 69% of the nation’s commercially available fruits and nuts. The oil industry uses about 2 million gallons of water a day, some of which is used in the controversial process of hydraulic fracturing, or fracking. One can certainly appreciate why the average citizen, being part of the minority in terms of water usage, bristles at the thought of being asked to make the majority of the sacrifice. It does smack of unfairness, which is why attention ought to be paid. But this meme…this is no good. The data in this meme are mismatched, and therefore incompatible without some number crunching. 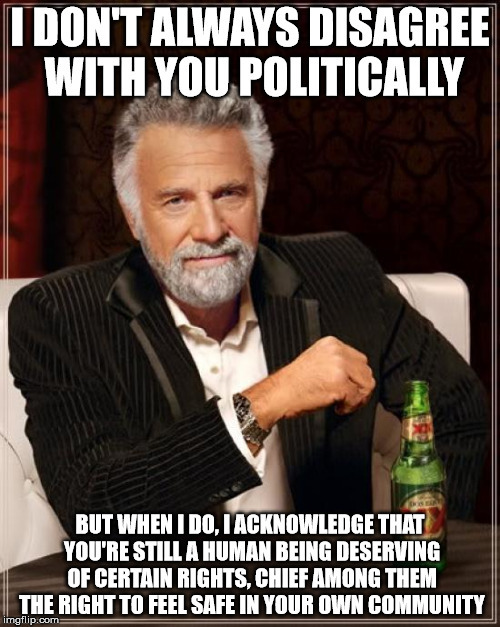 Since I’m not a Californian, I’d like to review this meme with a somewhat more objective eye (if I can fairly use that word – objective – to describe what I do in this blog). Let’s start by assuming the meme is correct in its assertion that it takes 1.6 gallons of water to flush the average Californian commode. Let’s further assume that every Californian flushes only once per day (and to be honest, it’s probably more than that). There are about 39 million people living in California, and if we multiply 39 million by 1.6 gallons, we get…carry the five…about 62.4 million gallons of water being used every day to flush toilets. Over the course of a year, that’s…hang on, let me get out my slide rule…about 23 billion gallons of water! That’s considerably more water than two of the examples the author picked for his meme. And remember, I gave everybody in California only one flush per day. Also, I didn’t account for any water that might be used for showering, cooking, brushing teeth, et cetera. The author of this meme is trying to make a point, and as I said before, I think it’s a valuable point: if John Q. Public is going to be restricted in terms of water use, then so should the largest water users in the state. But the author is going about it the wrong way. By bizarrely choosing to focus on some specific points in California’s water usage profile, the author has missed the big picture. This is why memes seldom work for complex topics; in an effort to cram your opinions into a small, digestible meme, you have to gloss over a lot of complexity and thoughtful consideration. When you do that, you lessen the impact of your arguments, and you make it easier for your critics to dismiss them. 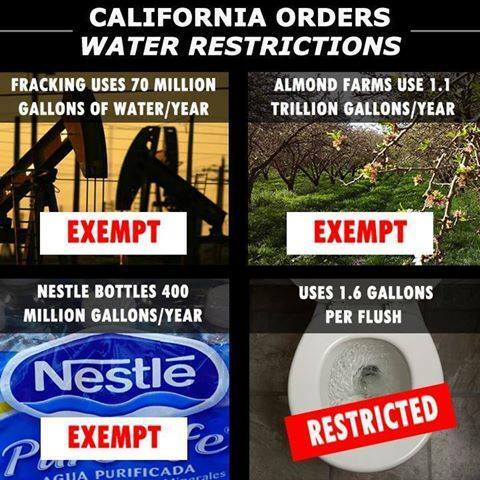 I agree with the author’s implied statement that the water restrictions mandated by Governor Brown’s executive order are lop-sided, but if I didn’t agree, it would only take me 30 seconds with a calculator to determine that I could safely ignore the content of this meme…and its author.